Last night I took a side-by-side comparison shot of myself for the #100daychallenge I’m doing with my gym girls. So far, we’ve been motivating one another with inspirational phrases, encouraging each other to hit the gym, sharing recipes/photos of meals, dishing on workout stats, etc. I definitely feel like it’s helping me stay accountable and keeping me on my toes. I haven’t taken measurements and wish I had, but my clothes definitely are fitting better and the scale is down a total of 7.4 pounds now — so that’s pretty good; that means 0.4 below pre-preg now, woot! Post-run selfie. Because … why not? I don’t hate running. I don’t. I just hate the idea of it. Once I’m out there, I’m fine. 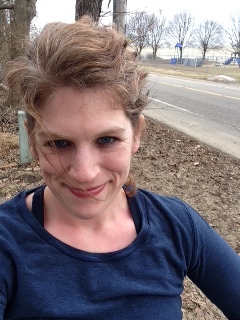 At least, that’s what yesterday’s 20 minute impromptu run (#wycwyc)– inspired by my good friend Staci’s awesome 4-miler this weekend — reminded me. This past Sunday, I knew we were likely going to have a sub for Zumba. 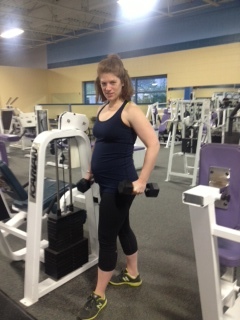 Since the Sunday class is during Maya’s naptime anyway, it’s usually easy for me to take an hour and get my fitness on. I figured I’d go and if the sub wasn’t one of the ones whose class I love, I’d just do the elliptical with one of my good friends and call it a day. Like many people around the world, we’ve been watching lots and lots of Olympics coverage. While I admire each and every one of the athletes (and of course am rooting for Team U.S.A.), I’m personally most interested in gymnastics — probably because I took gymnastics and dance lessons growing up and happen to find it the most interesting of all the Olympic sports. One thing I noticed was that while sitting here in front of the TV watching the coverage, I’ve been doing quickie ab workouts and lifting weights (both of which I’ve slacked off with since becoming pregnant with Maya — back in 2010. Oops). And, I’ve not been noshing.